Infinity in the mathematics world simply means you cannot count something with just the 10 fingers in your hands. But the same goes for the love that any mother has for her child. Even though not all mothers are saint-like – they have their mood swings and ups and downs too – their affection towards their offspring is infinite. The members of the Baltimore Orioles must be loving children to their mothers as well, because they even distributed this promotional scarf to some 10,000 female fans who have bought tickets to their game during the Mother’s Day. Sky-high Ticket Sales. The promo gift items that a certain sports team is going to give away can mostly be found on their respective websites and helps increase the ticket sales. This gives the fans a moment to plan when should buy tickets – sometimes based on who the team is playing against; other times based on the freebies they may get during the game. More Loyal Fans. We did our personal research and found that not all pro teams have special gifts to commemorate all the moms in the world. What this promotional scarf will do is it will bring more loyal fans to the team, and these people will be the ones cheering them on every season. Extra Brand Significance. 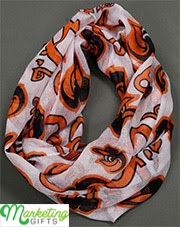 Baltimore Orioles is a men’s baseball team, that’s why this promotional infinity scarf for women is saying something – something that no words can truly express. The women in the crowd must have felt it too. In return, the team must have sensed their improved significance now to their supporters. Do your best to market your brand. Check out the Marketing Gifts blog today.